Just look at these beautiful pictures. They are cards from a new divination deck called the Messenger Oracle. I picked up a copy of the boxed set when I was at the Mind Body Spirit Festival in London simply because I was bowled over by the lovely artwork. The images are all so good that it was hard to pick just a few to show with this review. As you can see, the cards are inspired by nature, mythology and pagan spirituality. They show wild animals, ancient woodlands, faery beings, fantastic creatures of legend as well as the Green Man and the Green Lady. Artwork aside, the Messenger Oracle also works well as a divination set - particularly to draw a card each day to think about and meditate over, or to answer a specific question. The messages are both dark and light - they can tell us to face our fears or to be strong in times of challenge as well as to listen to our dreams and to be healed. The Messenger Oracle reminds me a little of both the Angel Tarot by Doreen Virtue and also the Wildwood Tarot, although it has its own unique style and is an oracle set rather than a tarot deck. On its website, publisher Blue Angel says that this is a deck that enables you to reconnect with the magic of the universe: "There was a time when we... were one with nature and moved in harmony with the seasons and cycles of life. We honoured and accepted the signs and messages sent by Gaia and Great Spirit. ... These cards are ‘the messengers’ who are here to guide us back to our true nature and power and to help us reconnect with and express our inner-most truth." The book that comes with the cards suggests some interesting and original spreads. These include a three-card reading to represent our shadow, our soul and how these two can become one, and also the Gaia Tree Spread for a fuller reading of the past, present and factors affecting the future. Just after I got the Messenger Oracle, I bumped into a few pagan friends who were also at the MBS festival and I showed them the cards. They liked the set so much that they asked me to point out the Blue Angel stand so they could buy one too - and I think it would appeal to most pagans. 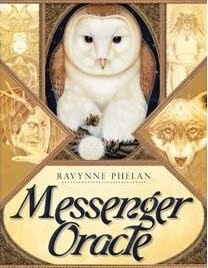 If you are stuck for a present to buy for someone who follows a nature-based spiritual path, then do have a look at the Messenger Oracle. Or, of course, buy it for yourself as a treat.